The father of a baby blessed by the Pope in Birmingham's Cofton Park has said he will keep the picture of it for the rest of his life. Kola Ijanson, from Manchester, saw his 10-month-old daughter Ronke picked out of the crowd by a security guard and handed over to Pope Benedict XVI. "It is has always been a family fantasy that she could be blessed by the Pope," he said. 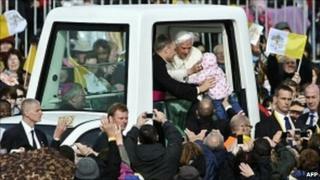 The Pope was visiting Birmingham on the last day of a four-day visit to the UK. Afterwards, Mr Ijanson said he was "so excited". "We were sitting where we should have been sitting and the news came to us that the Pope would be coming on the aisle behind us," he said. At first, his wife made her way to the aisle to take pictures. "I thought it would be nice just to hold the camera and get the baby and the Pope on the photos," he said. "But people started saying to us, 'what if the Pope blesses the baby?'. "Even at that stage I was thinking a shot of the baby with the Pope would be a miracle, not of the Pope blessing the baby directly," he said. As the Pope got nearer, and the crowd started cheering, Mr Ijanson said little Ronke started clapping. The family think it was that which attracted the security guard's attention, who then attracted the attention of the Pope. "The window [of the Popemobile] went down, [the Pope] took the baby from the security man, I want to believe he said a prayer and he gave her a kiss," he said. "I don't have the words to describe how I feel about it. "I will be sharing the news with everybody."